You can’t imagine how excited, proud, and DELIGHTED we are to finally invite you to create your account for free on goalmap. No need to read more, I want to create my account NOW ! By the way, what’s goalmap? goalmap is a revolutionary goal-setting and goal-tracking website that will help you reach your personal objectives and realize your full potential. It is a holistic platform with a comprehensive range of goals across 10 categories: Sport & Health, Intelligence & Knowledge, Arts & Crafts, People, Work, Personal Finance, Travels & Experiences, Religion & Spirituality, Beauty & Style, and Home & Garden. With goalmap, all your goals will always be in one place. Setting objectives: Define your life goals and set clear targets and deadlines for everything you want to achieve. Tracking activities: Keep a record of the things you achieve and the steps you take on the path to your objectives. Analyzing results: Visualize your personal analytics and know where you stand at all times as you progress toward your goals. It is proven that people who stick to their resolutions are more likely to make them happen! How does it work concretely? We don’t have a proper app yet but our website is responsive which means that its format adjusts to the format of your screen. It looks pretty nice on a tablet, and the mobile can be fairly handy when it comes to logging your activities during the day. Whether you want to tell us how much you love our platform, or hate it, or just want to give us your views on how we can improve it, feel free to tell us EVERYTHING. We promise not to be touchy. We’ll do everything we can to improve it on a very regular basis. This is COOL, right? Watch this space, we have big dreams => big goals. 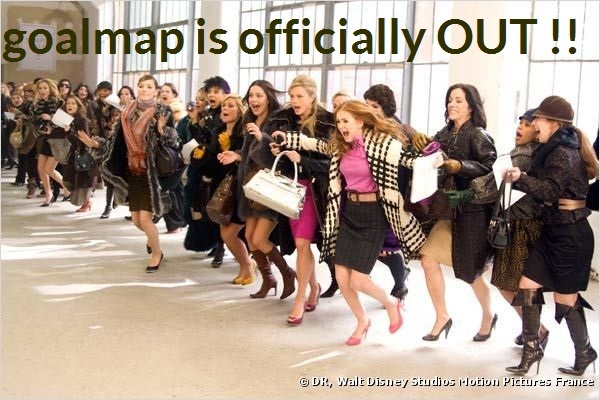 Until then, connect to goalmap here and join the adventure!